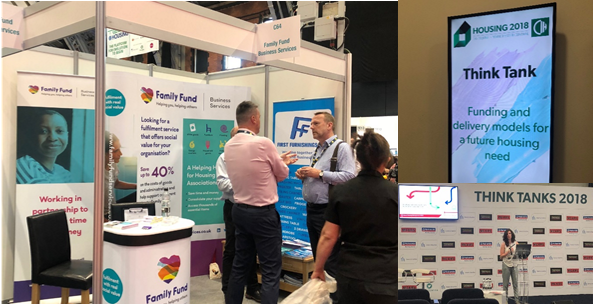 Family Fund Business Services enjoyed a fantastic three days at CIH Housing 2018 at Manchester Central, with over 8,000 delegates and 400 speakers in attendance, all passionate about affordable and innovative housing solutions. It was our first year exhibiting at Europe’s largest housing festival and we were delighted with the overwhelming interest and support as we introduced our service offering to many housing associations and local authorities from across the UK. “We had a great time meeting lots of professionals from across the sector who took a real interest in our fulfilment service and the added social value we provide. It was a fantastic platform for us to increase awareness of our partnerships and explain our unique offering which mutually benefits both parties. For many, it was an introduction to the work of both Family Fund Business Services and our parent charity, Family Fund, the UK’s largest charity providing grants for families raising disabled or seriously ill children and young people. However, given the platform to tell our story and explain how we partner with housing associations, local authorities and other grant-making charities, there was a lot of interest in how we can not only save delegates’ organisations time and money, but more importantly, how we can help them help others and create social value. Our unique business model enables us to offer a one-stop-shop for white goods, furniture, household items, flooring and mobility equipment and we share our supplier discounts with customers through our centralised online procurement portal. Partners are able to benefit from a guaranteed stock of quality products with extended warranties as well as an end-to-end service which includes delivery, installation, uplift and the recycling of packaging. This ensures both peace of mind and a reduction in the associated administration costs of managing these tasks in house. As a company that gifts our profits to our parent charity, we understand the importance of making funds go further. We know that improving efficiencies will ultimately result in helping even more beneficiaries and some of society’s most vulnerable individuals. Over the past five years our growing mutual partnerships have enabled us to issue customer rebates totalling over £1 million and the remaining supplier rebates of £2.9 million have been gifted back to our parent charity as unrestricted funds, helping them to develop new services and support families raising disabled children across the UK. “I’m delighted that FFBS continues to raise its profile within the housing sector. It is important for us to increase our reach so that we can support the fantastic work of even more housing associations across the UK by sharing our collective discounts with them. “By extending our service to more organisations and charities, FFBS can increase its buying power and supplier discounts, enabling the business to gift even more funding to our parent charity, Family Fund. This entry was posted in Events, Housing. Bookmark the permalink.